I considered a skirt, but it seemed like such a no-brainer and I wanted to try something that stretched my brain a little 🙂 Shorts are great for this fabric; it’s a perfect bottomweight! I totally agree. 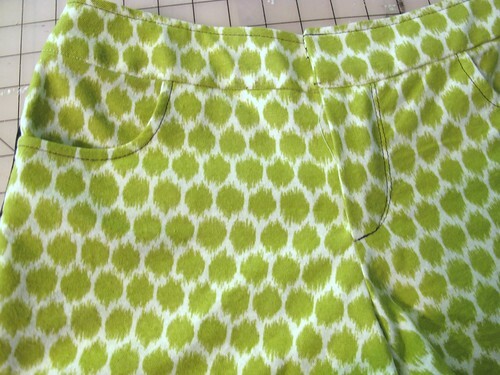 Skirt was a no brainer and shorts are super cute and perfect for this fabric!!! Those came out so great! I want a pair just like that! Well done taking a big challenge and mako something amazing. your legs have me rolling on the floor. that piping is GENIUS!!!!! i wish i had your legs to rock these shorts, scratched up or no! Your poor legs remind me of my sweet daughter. The bugs are so attracted to her, she gets eaten alive outside! 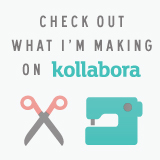 I love the piping addition on your shorts…they look awesome! I don’t know what’s up with the bugs and my legs! Funny, they will eat me up like I’m the most delicious treat around, but I very rarely have itchy bug bites to show for it after I get back inside. It’s so weird! Man I love the colour of these…such a cool pair of shorts and the piping rocks my world. And I agree with Oona… I’ll take your legs scratches or no scratches. Hahaha, got a great laugh out of the monet. So many of the things I sew are full on Monets. They look amazing! I would have never thought about matching lime green and navy blue but it looks great! Yikes @ your poor legs!! My poor men both get big nasty welts from mosquito bites though, so they can probably relate to you. 😦 I’m guessing you didn’t find a remedy that outweighs your appeal to the mosquito palate? I actually like these shorts, though I wouldn’t have had the first clue what to do with that fabric if I’d have gotten it in the mail. And who knew that it paired so nicely with navy?! 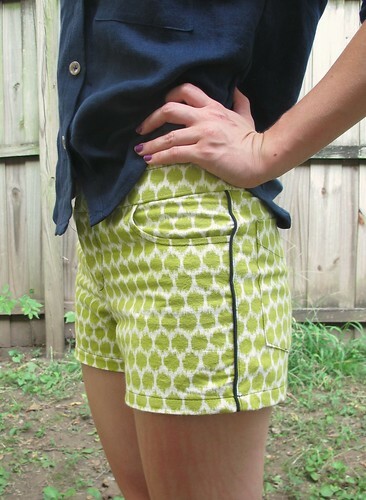 Love the piping with the shorts. The navy and lime go great together. 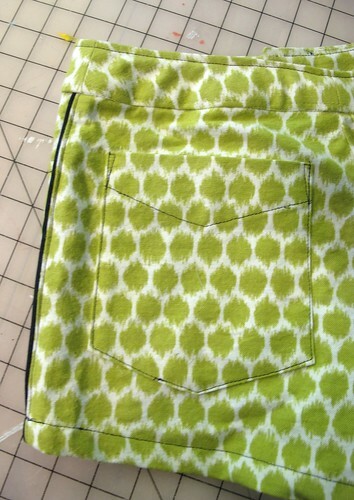 shorts were a perfect choice for this fabric! i’ve made thurlows a million times, i may branch out and try this pattern next summer. the piping is a genius move! subtle, but definitely adds a great detail! Cute! Tell me about the shirt. This is a cute outfit. Very cool shorts! You’re rocking them! It is far too chilly here in Scotland to be wearing shorts now, sad face. Maybe next summer.. I feel your pain about the mosquitoes… they always swarm around me, too! I can be outside with a huge groups of people and I’m the ONLY one that gets bitten. Go figure. But I love the shorts! Receiving anything that colour in the mail would freak me out too, but I love what you did with them, especially with the navy! I too just finished a pair of shorts, but I don’t think I’ll get much more wear out of them this year – the fall weather seems to have definitely arrived. Awesome shorts! The color combination is genius! They look beautiful together and the piping was a great call. All-around perfect pair, in my opinion. Whoa those turned out super awesome!!!! I love contests when they push you to sew something you wouldn’t think of doing otherwise, especially when the end result is something you unexpectedly love. Well done, Lady! Really cute shorts! Now I want a pair in a bright coloured print too! Love the green and navy blue. Perfect for these transition months in the south where it is still very WARM!! These look awesome!! Those are some freakin’ awesome shorts. Looks like you took a lemon and made lemonade! Congratulations for a job well done. 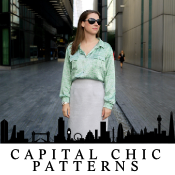 that pattern works great with shorts! def would have been a bit much (for me) as pants or a dress… would be cute as a clutch or some sort of lining too! also, you’ve gained a reader for life with that clueless reference. well played! I love me some Waverly fabric. There are lots of decorator fabric outlets here (middle NC, near High Point) because of all the furniture manufacturers. I made some wackadoodle jeans from two scraps of what must have been meant for draperies, just last week (Vogue 1054 — side panel and upper yoke are cut in one piece). DH’s initial response to the first wearing: “What have you got on?! [long pause] I mean, those are nice.” The reason you are instructed to dry clean these cottons is to preserve the polished finish, so greatly desired in window dressing. To dress your body? I prefer the softer effect of the washed cotton. 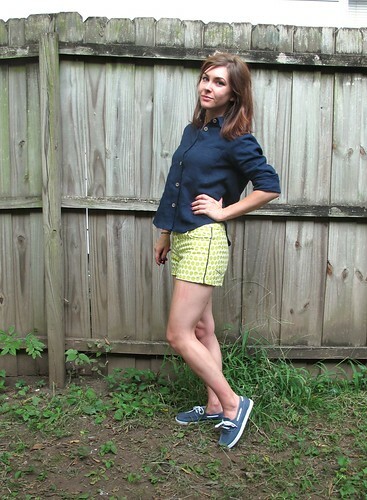 Happy wearing of your jolly, green-and-navy maritime shorts! Nice job on the shorts! 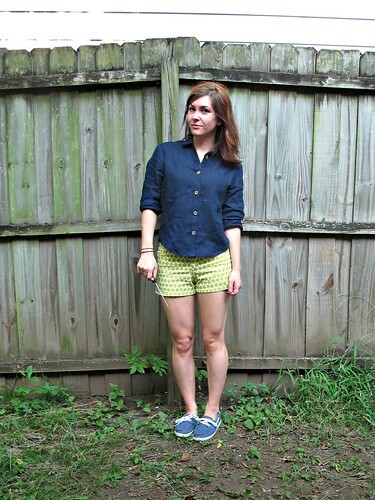 Top stitching looks great and you look fab in the shorts as well. Love the piping! Mosquitoes love me – so I feel fortunate to live in a dry climate where they just aren’t around. But I was on the East Coast last month and got nibbled by a few. What’s interesting is how being limited to a fabric you wouldn’t have chosen led to so much creativity! 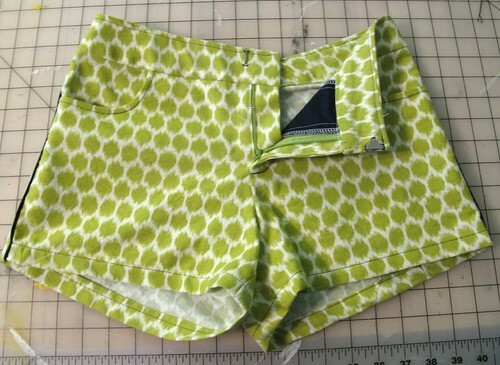 I love how these shorts turned out, they’re super cute, and the piping and topstitching are brilliant. Congrats! Ow! Mosquitoes are evil! There are millions here in Singapore and they like the taste of me (seriously – I went out with a friend of mine and she didn’t get a single bite; I got 28!!! ), so I totally feel your pain. Hope you didn’t get too badly bitten while photographing your AWESOME shorts! I love the piping and that topstitching rocks! Those shorts make you look like a total Betty 😉 nah you’re always gorgeous, however! those shorts are awesome. 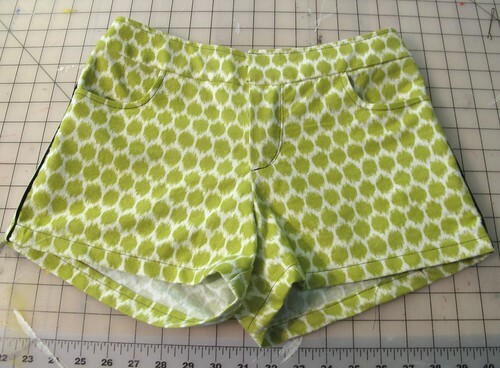 I keep seeing the maritimes everywhere and I’m on a quest for a good shorts pattern this summer, maybe this is a sign. I do love the colour with the navy! Good job! Love the shorts. Most bottoms seem to be for really bottom curvey people and these look like they might actually work on my more boyish waist/hips. At my age though, I think I’ll make them a tad longer. 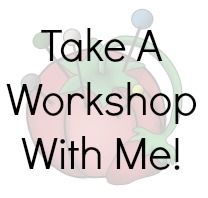 I love to see what you make. You are an inspiration. Could you go any further in to the fabric care issue? 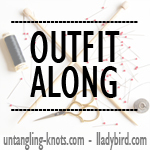 I am terrified to start sewing with anything pricey or made with fibers like wool or anything because I don’t want to have to pre- dryclean my fabric or dry clean the finished product for that matter. 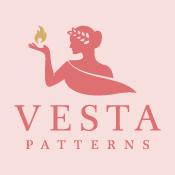 Have you ever had a mishap with any of the gorgeous fabrics I’ve seen you use by machine washing or drying them? So, to answer your question – I put *most* everything (cotton, denim, knits, rayon, etc) in the machine on cold and dry it in the dryer to prewash. If you’re concerned about dye bleeding, wash it by itself (or with dark colors), but I’ve never had something bleed… yet. I know the feeling of it being scary to throw something in the wash, but I figure I’d rather have it ruined *before* I spend all that time making it, rather than after the first time I wear it! For wools, obviously you don’t want to prewash those in the machine… you can either take them to the dry cleaners or preshrink it in your dryer (I do the latter, very good results!). Hope this helps! These are super cute, I think you did an amazing job! I love the colour but then I’m well known for my excessively garish taste, but I’d never have thought to pair it with navy which is the perfect foil for it. Genius. The shorts are adorable! They are so well constructed. I had not looked at your legs until you mentioned them! Poor girl. I’m glad for you that there are no after effects from the bites.